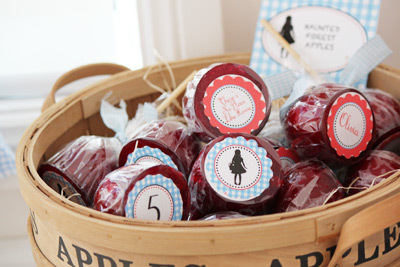 Here's an amazing party for all you craft Mums out there. 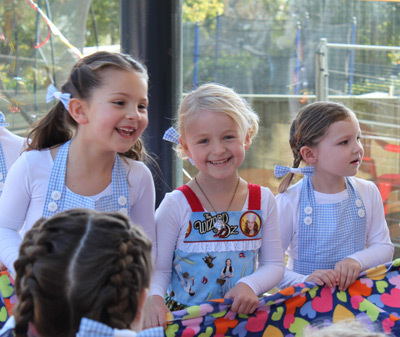 Lucky 5-year-old Olivia's Mum Alex put together an fairytale Wizard of Oz-themed birthday party that will knock your socks (and ruby red shoes) off. 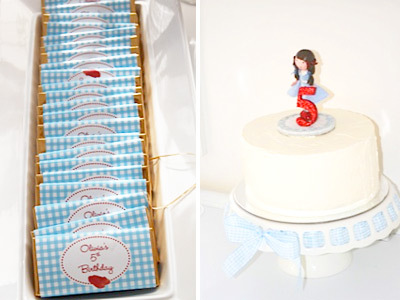 Guests were sent an invitation package including a blue gingham apron and hair bows to get the party started in style. 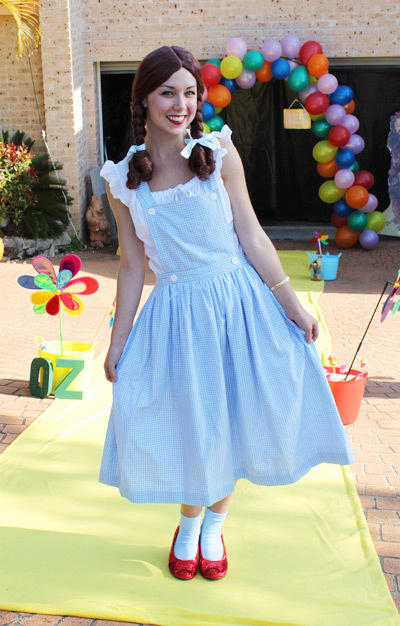 Alex and her husband integrated all the wonderful Wizard of Oz themes into the party including rainbows, tin men, cowardly lions, scarecrows, wicked witches and a real-life Dorothy to entertain guests. Alex shares her tips and tricks below. Enjoy! Location: Our place in Lilli Pilli, NSW. Invitations: The TomKat Studio - ordered as a printable file and printed at home. 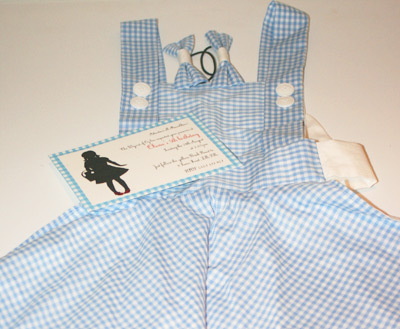 Aprons were sent out with the invitations with hair bows and were made by turquoisetiki on Etsy. Cake: The cake and cookies were made by Kate of Kate's Cupcakes and the cake topper was made by Baby Blossom on Madeit. 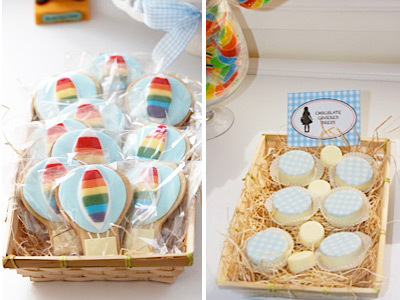 Party Food: Rainbow cookies, ruby slipper cookies and hot air balloon cookies made by Kate's Cupcakes. Cake pop ice cream cones made by Popular treats. Wicked witch leg cupcakes, chocolate covered oroes with edible gingham chocolate tranfers, toffee apples, over the rainbow fruit salad, scarecrow sandwiches all made at home. 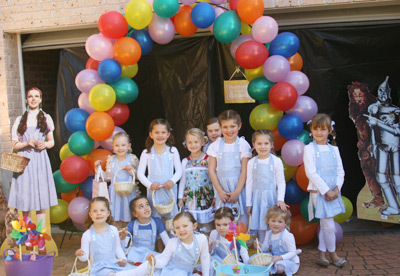 Decorations: My husband and I built a balloon arch using a garden arch we bought at Bunnings and then tied ballons onto it. We bought yellow material from Spotlight and rolled it down the driveway. We blacked out the garage with black plastic and made a tunnel through using more garden arches and made it like the spooky forset in the movie- we had the winged monkies and mini witches hanging from the ceiling. We bought two stand up cut outs on of dodorthy and one of the tinman, scarecrow and lion for out the front too. We used colourful pots and put coloured spinners and tiny little munckin hosuses in them to make it look colourful and like munchkin land. We had Wizard Of Oz bobble heads. 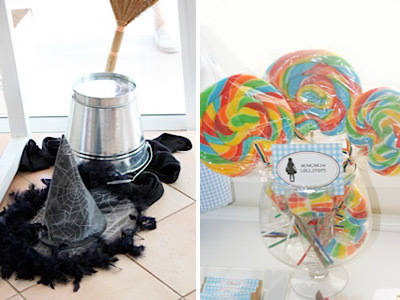 I stuffed striped tights with newspaper with a pair of ruby slippers and stuck them under the couch and had a pile of black clothes and a bucket and broomstick for the "melted witch". The most special decoration was the handmade tinman made out of tin cans he was so adorable! Tips: I would definitely recommend some entertainment. The kids were kept so busy and it gave me time to organsie last minute bits and pieces and I was able to watch my daughter enjoy her party with "Dorothy" from Fairy Crystal. It added that extra something special and the children truly believed it was Dorothy. She entertained them for hours and it was such a pleasure to watch them all so taken with the adventures of Oz! 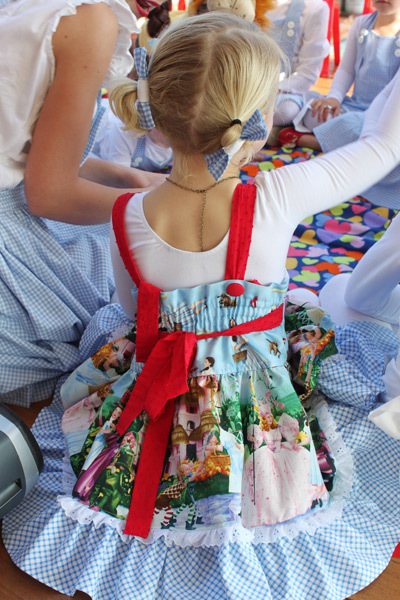 Something Special: A few days after Olivia's party "Dorothy" sent her a beautiful letter saying how much she enjoyed the party. I thought this was a lovely touch from the girls at Fairy Crystal. Thank you so much Alex for sharing your daughter's amazing party with us. It looks like all the mini Dorothys had a wonderful time. This is fabulous! What a special party! I love this! 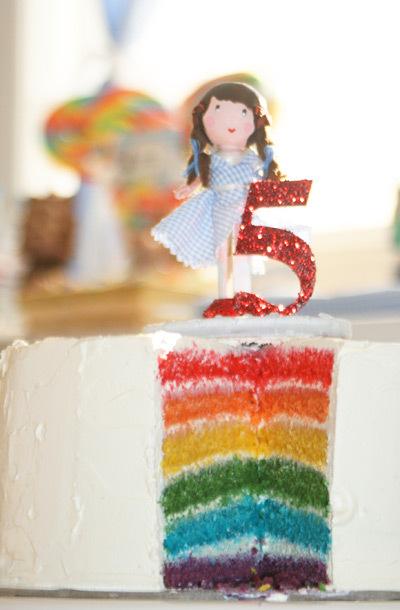 I thought I went all out for parties, but this is definitely somewhere over the rainbow! Look at all of those gorgeous sweet treats! Lovely theme and very special party - congratulations! What a fantastic theme! And gorgeously implemented.. Wow! Thanks for sharing . 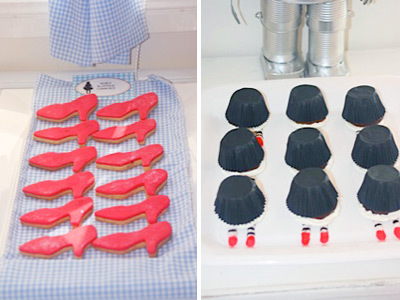 The pictures for this party are absolutely adorable. I recently found your blog as a source for a lot of hits with my etsy shop, so seeing that my client loved the aprons and put this much work into it and you featured the party here is really awesome. It's a way for me to see the outcome of something I'd normally just hear about. Very cool.